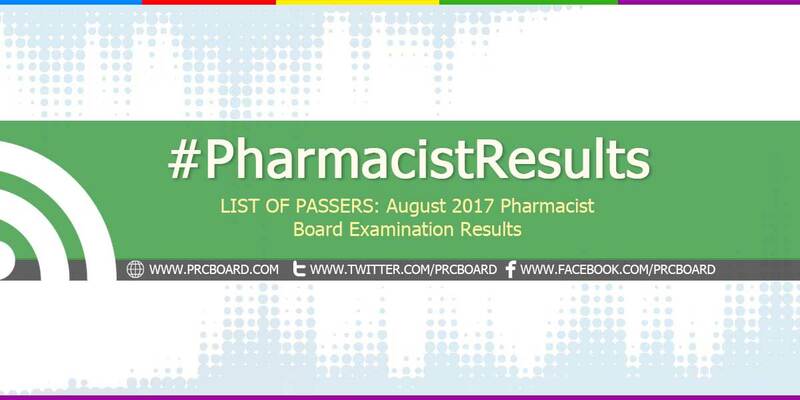 MANILA, Philippines – The 'August 2017 Pharmacist board exam results' together with the list of passers, top 10 examinees, top performing schools and related announcements are available at this website as PRC officially released the results online two (2) working days after the last day of board examination. As announced, 2,784 out of 5,079 passed the exams. The licensure examinations are administered by PRC Board of Pharmacy headed by its Chairman, Ms. Adelina C. Royo and its members, Dr. Mildred B. Oliveros and Mr. Anthony Aldrin C. Santiago on August 30-31, 2017 at PRC testing centers in Manila, Baguio, Cebu, Davao and Iloilo. The schedule of online appointment for issuance of Professional ID and Certificate of Registration will be start from September 11-14, 2017. According to the Commission’s Resolution No. 2016-1019 series of 2016 entitled “Schedule of Licensure Examination for Year 2017”, the target release date of August 2017 Pharmacist result will be in two (2) working days after the last day of board examinations or by September 5, 2017 (Tuesday). However, results may also be released earlier or later without prior notice. On the same exams conducted by PRC on March 2017, January 2016 and June 2016, results were released after two (2) working days. The two days Pharmacist board exam covered topics from Pharmaceutical Chemistry (20%) which includes Inorganic Pharmaceutical and Medicinal Chemistry, Organic Pharmaceutical and Medicinal Chemistry and Qualitative Pharmaceutical Chemistry; Pharmacognosy (15%) which includes Plant Chemistry and Biochemistry; Practice of Pharmacy (17.5%) which includes Compounding-Dispensing, Clinical/Hospital Pharmacy and Pharmaceutical Calculations; Pharmacology-Pharmacokinetics (15%) which includes Toxicology, Incompatibilities and Adverse Drug Reactions; Pharmaceutics (17.5%) which includes Manufacturing Pharmacy, Pharmaceutical Dosage Forms, Physical Pharmacy and Jurisprudence and Ethics; Quality Assurance and Quality Control (15%) which includes Drug Testing with Instrumentation and Microbiology and Public Health. During March 2017 Pharmacist board exam, 2,426 out of 3,732 examinees passed. University of the Philippines - Manila ranked first in the top performing schools' list having all of its 54 examinees passed or 100% overall passing rate. Rhys Jansen Tiu Pavon and Ser Loisse Rodriguez Mortel, both from University of Santo Tomas (UST) got the first two spots having 94.73% and 93.70% respective ratings. To receive up-to-date news about Pharmacist results for August 2017, we advise our visitors to bookmark this page, visit PRC official website or follow us at our social media pages via Facebook and Twitter. Claim it by faith! RPh na tayo bukas guys! God bless us all. Kahit anong maging result. Always look at the brigther side. Kapit lang. Keep positive guys, God bless..
Future RPh, good luck and God bless! Keep the faith! I'm hoping na makapasa yung kapatid ko.to GOD be the glory! Anong oras ang result bukas? Ako lang ba ang hindi makakatulog ngayong gabi? Congrats mga bagong pharmacist ng Pilipinas!! God speed! Believe and trust him. And he will never fail you. ADMIN WHAT TIME PO RELEASE? HI PO ADMIN! WHAT TIME PO RELEASE? "Rise up in faith, and know that when you BELIEVE it, you will RECEIVE it." To GOD BE THE GLORY .Congrats in advance UICians-Davao papasa kayong lahat!!! Nakakakaba mag antay ng results. What time po possible marelease ang result? Thank you. Sa may bulletin board sa labas ng PRC may results na po. Pero di pa sya complete. Yung mga nag exam sa Mary Chiles at PRC Annex palang ang results na andoon. Don't know if they updated na. IN JESUS NAME RPh NA TAYONG LAHAT SEPT 5, 2017!!!!!! Umaga pa lang waiting na ako sa result, GOOD LUCK po sa mga nag-take, tandaan nyo po palagi kapag para sa inyo ang RPh para po yan sa inyo. i-Claim nyo na po kahit pakiramdam nyo e talagang mahirap, ganyan din po ako dati pero binigay naman sakin ni Lord. Congratulations in advance. Always put you HOPE in God. GOODLUCK EVERYONE, GODBLESS TO ALL OF YOU! Madami po ba laman ng csv file? God Bless to our ates and kuya of FEU-NRMF! And sa lahat ng schools! Sobrang tagal. Parang sasabog na puso ko sa kaba para sa mga friends ko na nagtake. Haist. ano oras po lala bas results? Lord let Your will be done. I know magiging RPh po ako/kami. Amen! Good luck and God Bless sa lahat!!!! Cge lang prc sanay naman akong naghihintay e! Si stella nga naantay ko, results pa kaya? lol ang tagal kanina pa ko umaga naghihintay! I was willing to wait... Kaya lang napagod ako. Napagod ang puso ko na maghintay, magtanong, magalit. God bless po sa ating lahat RPhs 🙏🏻 Keep the faith. admin anong oras po lalabas ang resulta ubos na pinaload ko hahaha..
Congratulations to our new Registered Pharmacists! Hi is it okay na magparegister after sept 14? Can we still register po ba kahit late na? Can you please clarify, Sept 11-14 pwedeng magpa-appoint pa lang, or dun makukuha yung COR and PIC?